Sam Riley, CEO of Ansarada, a company helping PE/VC firms, large corporations, small companies, their advisors and everything in between manage all their business-critical events like IPOs, M&A, funding, property management, etc. 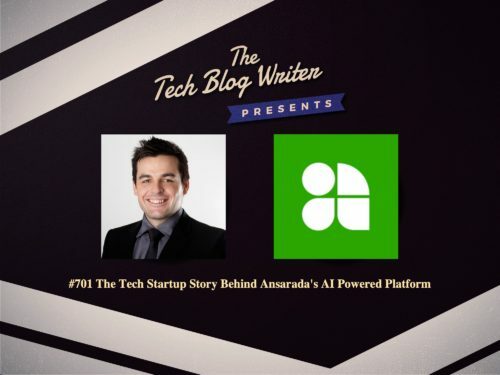 Ansarada has over $35 million in revenue and harnesses the power of AI to apply data and learnings over 20K deals taken place on its platform to predict outcomes of deals. With customers like Google, JP Morgan, KPMG, Deloitte, Minter Ellison, Sony, Pivotal and others, Sam has built Ansarada into a trusted advisor and tool for companies around the world. But I wanted to learn more about his inspirational tech startup story. Sam is a borne entrepreneur – starting out by buying and selling light bulbs for a small profit to his neighbors at age 7 to organizing neighborhood car washes as a teenager in Australia’s Blue Mountains to bootstrapping Ansarada from the ground up to the 200+ person international company it is today. However, the story behind why integrity and trust are at the forefront of his business will blow you away. I also learn how they have run thousands of deals through their data room product and realized that a business is never better prepared or in better shape than at the end of a material deal, like raising funds or selling. Why wait for a make-or-break event to become aware, prepared and connected to the tools and advice needed to be successful? A material information platform makes it easy to put this wisdom to use in your business today and make what’s next visible and actionable now.